As a means of giving back to the community, the Charleston RiverDogs close the office one day each month during the off-season to complete a day of volunteer service with a local nonprofit organization. On November 12th, eleven members of the Charleston RiverDogs front office staff spent the day in Ravenel, volunteering with Feline Freedom Coalition, Inc. A truckload of sand was delivered to the site, to be dispersed to three of the outdoor cat houses. 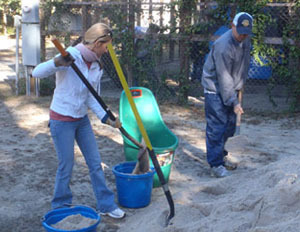 The team worked together to shovel the sand into buckets and wheelbarrows, then the sand was spread out into the pens. Together, the RiverDogs staff was able to move all of the sand to complete the project in hours as opposed to the months it had taken the organization in years past. Feline Freedom Coalition, Inc. is a nonprofit organization providing services and support to individuals and community groups interested in using TNR (trap, neuter, return or re-home) to effectively control the overpopulation of free roaming cats in Charleston County. The organization provides education and information to the public, property decision makers and governmental agencies through the TNR Community Hotline and TNR training programs. In addition, volunteers facilitate the work of caretakers involved in colony management and support the adoption of feral cats and kittens through Petsmart’s Adoption Outreach Program. 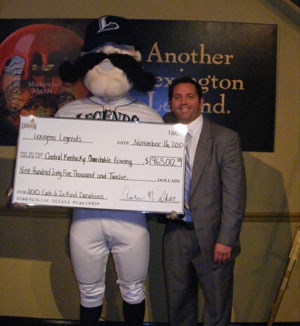 The Lexington Legends announced donations for 2010 totaling $965,012 to a variety of non-profit organizations serving central Kentucky. The Ivy Walls Charitable Giving Foundation Fund at Bluegrass Community Foundation, in cooperation with the Legends and business sponsors, presented checks to organization representatives today in the Maker’s Mark Club at Applebee’s Park. In its 10-year history, the Legends organization has donated more than $9 million to the region. Ivy Walls Management is a Lexington-based organization that manages the operation of minor league baseball teams, including the Legends. –The Makenna Foundation. Established in 2001 in memory of Makenna David, who died of a rare lung disease in 1998, the Makenna Foundation has raised more than $1.2 million for the Kentucky Children’s Hospital. The Legends’ Charity Ball Toss event, sponsored by Copy Express, generates funds for general support of the Makenna Foundation. –Big Brothers Big Sisters. Big Brothers Big Sisters is the oldest and largest youth mentoring organization in the United States, and has worked for more than a century to develop positive relationships that have a lasting impact on young people. Raising Cane’s donated $25 to BBBS for every Legends win at Applebee’s Park. The Legends also worked with LM Communications to plan and present a “radiothon” to raise funds for BBBS. –The Markey Cancer Foundation. The Legends’ campaign to “strike out breast cancer,” sponsored by ADI, provides five dollars for each strikeout recorded by Lexington pitchers during home games. The fight against breast cancer is also supported by the Legends’ Breast Cancer Brunch and the sale of pink game jerseys, also sponsored by ADI. –Kentucky Pink Connection. The Breast Cancer Brunch and the sale of pink game jerseys also benefit the Kentucky Pink Connection program, which serves breast cancer patients on a personal basis by reducing and/or eliminating barriers to screening, diagnosis, and treatment. –Junior Achievement. Donations were made to JA from the proceeds of the Brewgrass Festival, a beer-tasting and entertainment event held at Applebee’s Park in May. A bowl-a-thon also raised funds for JA, and several Legends employees volunteered and taught classes in the JA program. -St. Joseph Hospital Nursing Scholarship Program. The sale of regular game jerseys worn by Legends’ players provides general support for the program, which provides one- and two-year scholarships to deserving nursing students at area colleges and universities. –Lexington Humane Society. Sponsored by IncrediPet, the Legends held two “Bark in the Park” nights during the 2010 season. After making a donation to the Humane Society as an “admission” charge, fans could bring their dogs to the Legends game on “Bark in the Park” nights. Courtesy Acura donates to the Humane Society based on walks to Legends batters. Also, portions of proceeds from vendors who set up exhibits at Applebee’s Park on those nights went to the Humane Society. -The Boy Scouts of America Bluegrass Council. Sponsored by Windstream, a $25 donation is made to the Boy Scouts for every double or triple by a Legends player during home games. –Eternal Valor. The Eternal Valor Foundation’s mission is to facilitate and assist in the creation and management of scholarships, charities and events in order to honor the memory of deceased veterans. On Military Appreciation Night, the Legends sold fatigue jerseys to support Eternal Valor. -“Guns ’n’ Hoses” softball game at Applebee’s Park. Sponsored by Gall’s, the game matches Lexington police officers against firefighters. In 2010, proceeds went to the family of Lexington police officer Bryan J. Durman, who died in the line of duty. The Legends also make substantial in-kind donations throughout the year, including a long-standing relationship with United Way of the Bluegrass. Donors to the United Way of the Bluegrass campaign receive two free box seat tickets to a Legends home game. In the 2010 season, more than 44,000 box seat tickets were given to United Way donors. Other in-kind projects were associated with Special Olympics, the walk to defeat ALS, the Kentucky Center for Oral and Maxillofacial Surgery’s Smokeless Tobacco Education program, and Hit the Books, a joint effort between the Legends and Chick-Fil-A to encourage Central Kentucky students to read. Legends' Mascot, Big L, and General Manager, Andy Shea. Country music fans enjoyed a great night of entertainment September 24 at Applebee’s Park, home of the Lexington Legends, and victims of flooding in Pike County benefited as a result. With funds generated by a special concert ticket promotion, the Legends presented a check in the amount of $16,560 to the Pike County Long-Term Recovery Committee, Inc. The Committee is a volunteer organization based in Pike County that provides relief for victims of the July 17 flooding. Tickets to the concert, which featured Randy Travis, LeAnn Rimes and Craig Morgan, could be purchased with a special promotional code which placed $20 of the $37 ticket price into a fund for the Pike County Long-Term Recovery Committee, Inc. The Legends also provided concert tickets free of charge to flood victims. Legends representatives joined local and state government officials, as well as representatives of the Kentucky Coal Association and other businesses and organizations, for the check presentation ceremony Friday morning at the Pike County Chamber of Commerce. Left to right: Lexington Legends account executive Scott Hamilton, "Big L," and Randy Johnson of the Pike County Long-Term Recovery Committee, Inc. hold a replica of a check for $16,560 that was presented Friday by the Legends to the committee to benefit flood victims. Because of the organization’s positive impact in the community, the RiverDogs will be the 2010 recipient of the Outstanding Corporate Philanthropist for the Charleston Region Award, as provided by the Charleston Regional Business Journal. The citation will be presented by the Association of Fundraising Professionals on National Philanthropy Day on Nov. 18 at the Charleston Marriot on Lockwood Blvd. with RiverDogs team president Mike Veeck accepting the award on the team’s behalf. In their most recent issue, the Charleston Regional Business Journal cites the many involvements to the community that the RiverDogs involve themselves in throughout the calendar year. When not in season, the administrative staff closes the office for a day and, as a group, donates time and energy to a worthy cause, like Habitat for Humanity. MUSC’s Storm Eye Institute is the RiverDogs’ primary charity, due in part to Veeck’s daughter, Rebecca, suffering from a retinitis pigmentosa, a visionary disorder that left the personable teenager legally blind. However, not all of the club’s efforts are devoted toward fighting blindness. The RiverDogs, the Class-A affiliate of the New York Yankees, are deeply involved with the RBI Program (Reviving Baseball in Inner Cities) and the Boys & Girls Club by providing assistance with equipment and travel, while team members help with practices. Additionally, the organization made a huge commitment to Charleston County Schools. They helped create a reading and fitness program for third graders, and participate in a sports and entertainment academy in the high schools to expose students to the business side of sports. And during the season, each Monday night’s home game is appropriately billed as “Dogs with a Cause Night” and is devoted to a local non-profit organization as the group is positioned to share its mission with fans. “The idea is that if you are interacting with the community and giving back, you will feel good, and in ways you are able to be an overall more well-rounded and happier person. And that will translate in the workplace,” Echols said. Fans share their valuable time during the season with the RiverDogs, so it is only fitting that the RiverDogs return that time in various charitable efforts to maximize the potential of community involvement. And with the club’s “Be Your Own Fan” marketing initiative, the off-season contributions by the organization gives citizens another reason to be a RiverDogs fan. The Charleston RiverDogs initiative of “Be Your Own Fan” took another leap as the club, which recently partnered with ServiceMaster, combined to make a $10,000 donation to NASCAR great Kyle Petty’s Victory Junction. The $10,000 will go to a scholarship for Lowcountry children to attend Victory Junction, which has a direct tie with the Medical University of South Carolina’s Children’s Hospital. Victory Junction located in Petty’s hometown of Randleman, NC, is a camp that is designed to enrich the lives of children with chronic medical conditions or serious illnesses by providing life-changing camping experiences that are exciting, fun and empowering in a safe and medically-sound environment. The program offers a week of exhilarating, challenging and nurturing fun under comprehensive, but unobtrusive, 24-hour medical supervision. The RiverDogs and ServiceMaster teamed for a season-long promotion. For each RiverDogs victory, ServiceMaster of Charleston and the RiverDogs donated funds to Victory Junction. Victory Junction Night on Aug. 31 featured Petty, a part-time Isle of Palms resident who was on hand to sign autographs and help raise money. The NASCAR tire changing simulator was on location at Joseph P. Riley, Jr. Park and fans made a donation for the opportunity to win a Richard Petty Ride-along experience. The fans with the fastest tire change were declared the winner. Representatives from Victory Junction were on hand to visit with fans and provide information about Victory Junction.